Alyssa Milano is opening up about her long running feud with her former “Charmed” co-star Shannen Doherty. According to Alyssa, she and Shannen decided to end their feud after Shannen was diagnosed with breast cancer in March 2015. After years of bitterness, Alyssa admitted in an interview Thursday, that the two are in contact, saying, “Shannen and I talk a lot on Twitter (via DM) and I spoke to her maybe two or three days ago. She was on vacation and we decided that we’re going to get together. That date has not been set yet”. The former co-stars had a very public falling out when Shannen left their successful television show after three seasons and a lot of behind the scenes fighting between Shannen and Alyssa. Shannen once explained her exit by saying she was done with all the drama, while Alyssa was angry about Shannen insulting “Charmed” by claiming it was a show for 12 year olds. But now Alyssa is calling their beef ‘irrelevant’. After 15 years, Shannen’s cancer diagnosis, and Alyssa becoming a mother, Alyssa says they are changed people and she and Shannen can’t wait to see each other in person. 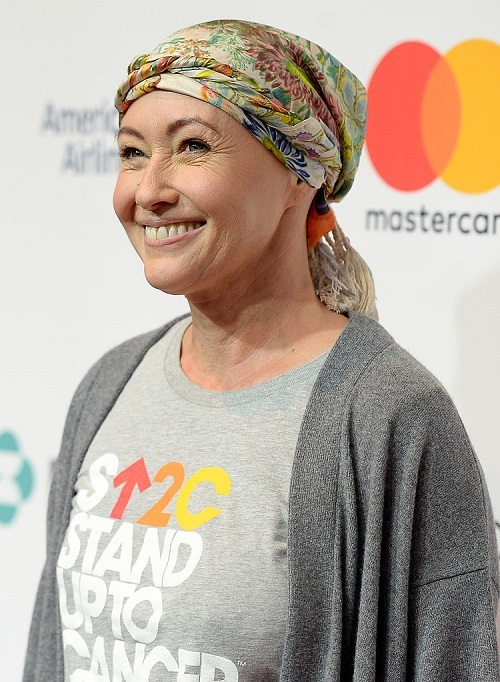 She also added that she prayed daily for Shannen’s health, and is happy that Shannen’s cancer is currently in remission. Alyssa is not the only former co-star Shannen has made amends with. She also famously feuded with her Beverly Hills: 90210 co-stars Jennie Garth and Tori Spelling. But Shannen and Jennie made up when the two co-starred on the Beverly Hills: 90210 reboot portraying their former characters. Since then Jennie has been a vocal supporter of Shannen, posting about Shannen’s strength and their friendship during her cancer battle. However, there is one person that Shannen has yet to make up with. She and Tori Spelling still appear to be on the outs. Although the pair was very close during the first few seasons of 90210, often getting photographed partying together, Shannen was later fired from the hit show for unprofessional behavior. Years later Tori wrote an unsavory tell-all spilling secrets from the hit teen drama. In the book, Tori claims Shannen and Jennie once engaged in a physical fight that ended with Jennie punching Shannen. Shannen disputed this claim and wasted no time blasting Tori’s book as a work of fiction. Check back with CDL for more Alyssa Milano and Shannen Doherty news and updates.